Freddie isn't quite as strong as he was in Stockholm and Copenhagen, but he is still in great voice. From night to night he is still generally more consistent than on most previous tours. 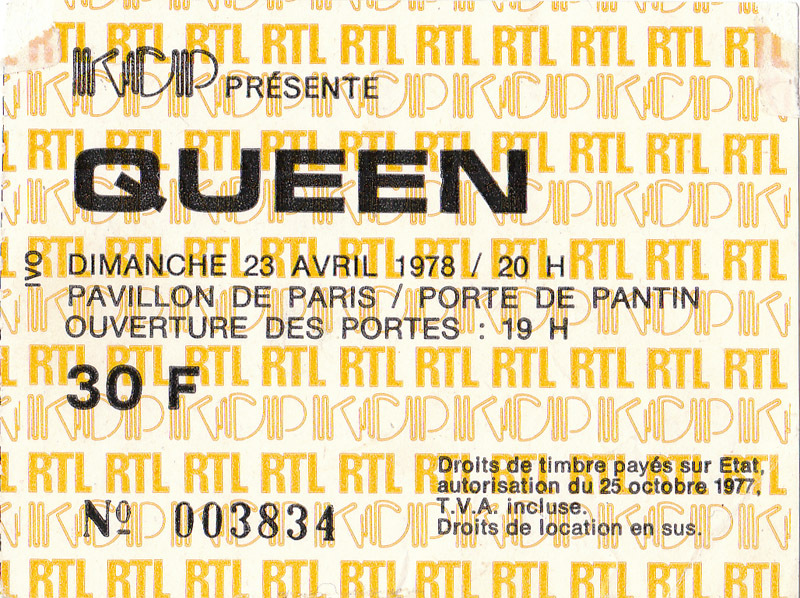 Since it's Queen's first show in France, Freddie keeps trying to speak French, and it's often amusing. He also converses with specific audience members in the front rows quite a lot, creating a very informal atmosphere. "Bonsoir mesdames et messieurs," greets Freddie after the first song. "Comment ça va?" He adds, "That's all they get." He's happy enough that he managed this much French for his first impression. "It's very nice to be here in Paris, France, after such a long, long time. Thank you for coming to see us." He then responds to a request for Liar. "We might do it," he says. Not tonight, but perhaps on the second night they would, as they did in Rotterdam. He then asks another audience member what their name is. They respond, "François." 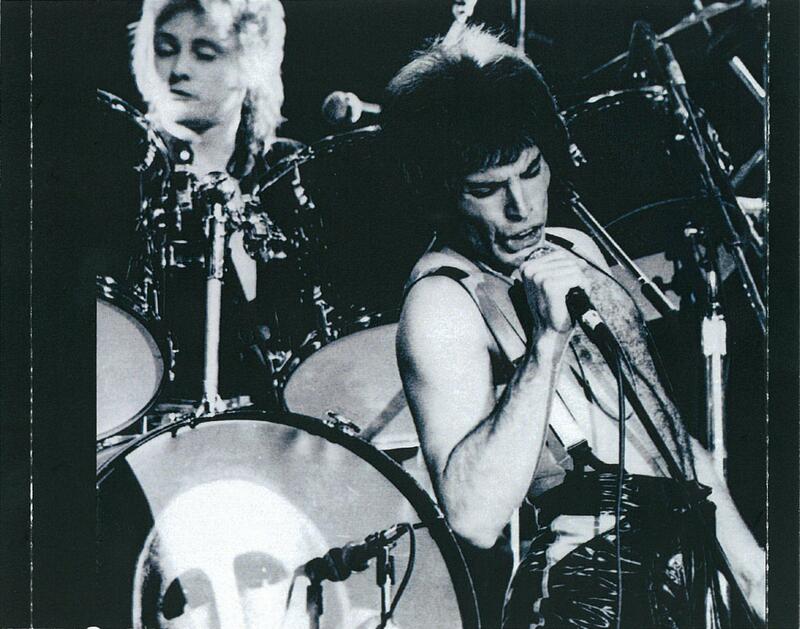 Freddie then asks if that's a boy or girl's name, and quickly introduces Brighton Rock as the next song. 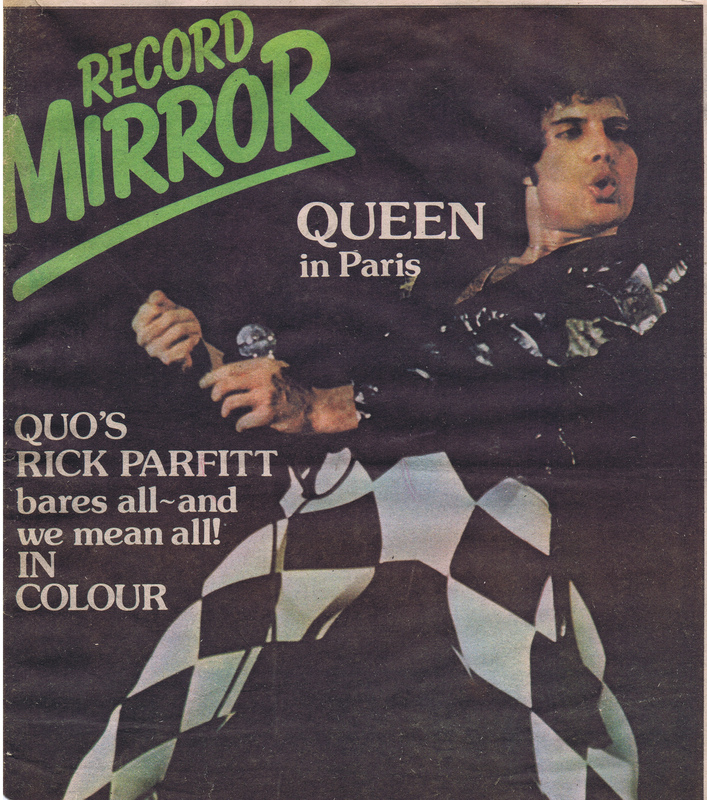 Freddie, with his glass of champagne after Somebody To Love: "We would like to drink a toast to Paris. A votre sante, Paris!" The audience respond well to it, and Freddie adds, "I think they got that." 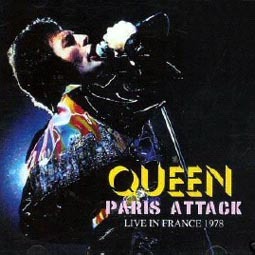 After pointing out that it has taken the band six years to come to France, he introduces the first song of the medley as being from A Night At The Opera. 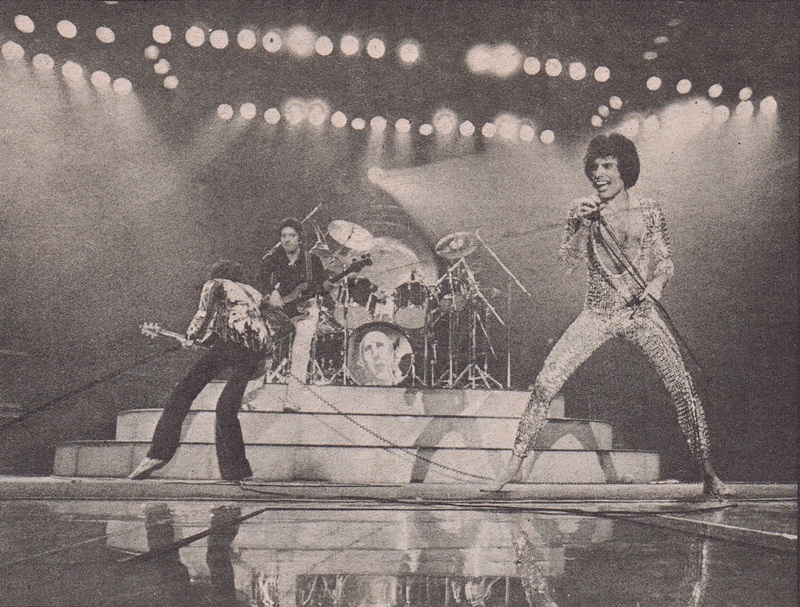 The audience are very happy with the pronouncement, and Freddie responds, "Maybe we did come here before." 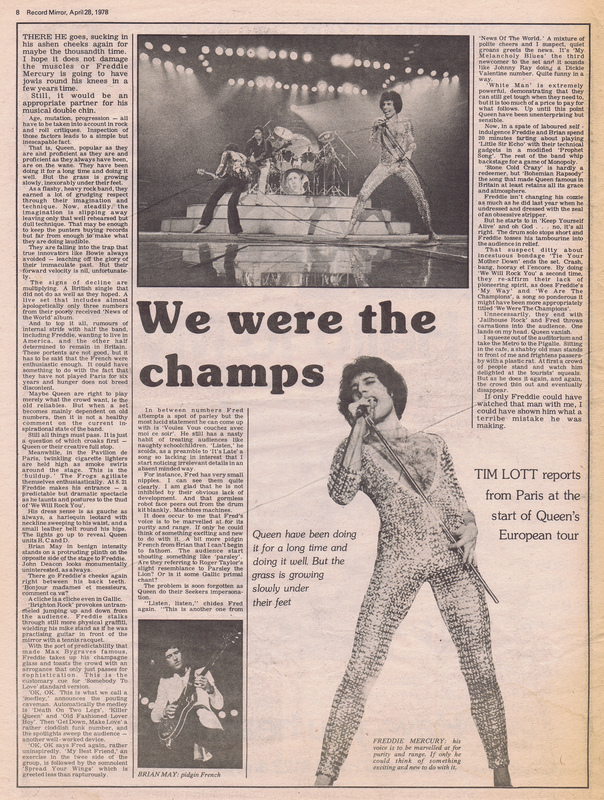 After the medley, an audience member shouts for We Are The Champions, and Freddie has a very clever response. "We know that, don't worry. You are the champions; you finally got us here!" 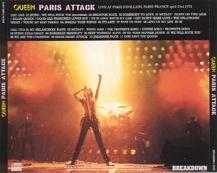 After the band play a great version of Spread Your Wings, Freddie says, "We really like doing that song. It's a really nice tune from John." He then states that the song is their current single release in France, and it garners little response. He resorts to the classic "voulez-vous coucher avec moi ce soir?" He tells an audience member, "Don't worry, you'll be lucky." He continues, "Listen, if you'd like to sing along, you know, chantez or whatever it's called, you're quite welcome to. Or clap your hands. You can do anything you'd like." Brian has a go at speaking some French as well, calling Love Of My Life "un chanson d'amour," after which he gives up. "I'm gonna speak in English," he concedes. But before '39, he asks them, "Vous voulez chantez?" During Jailhouse Rock, Brian sneaks in the riff from The Beatles' I Feel Fine like he did last year in New York. He played it again at the Mannheim '86 show, and even at a guest appearance at a Black Sabbath concert in 1990 in London. That show was actually the first time Brian played with Neil Murray and Cozy Powell (since they were both in Black Sabbath at the time), so that evening can perhaps be seen as the birth of the Brian May band of the '90s. This review of the show from April 28th Record Mirror (1, 2) is harsh in places, but bang on in others. 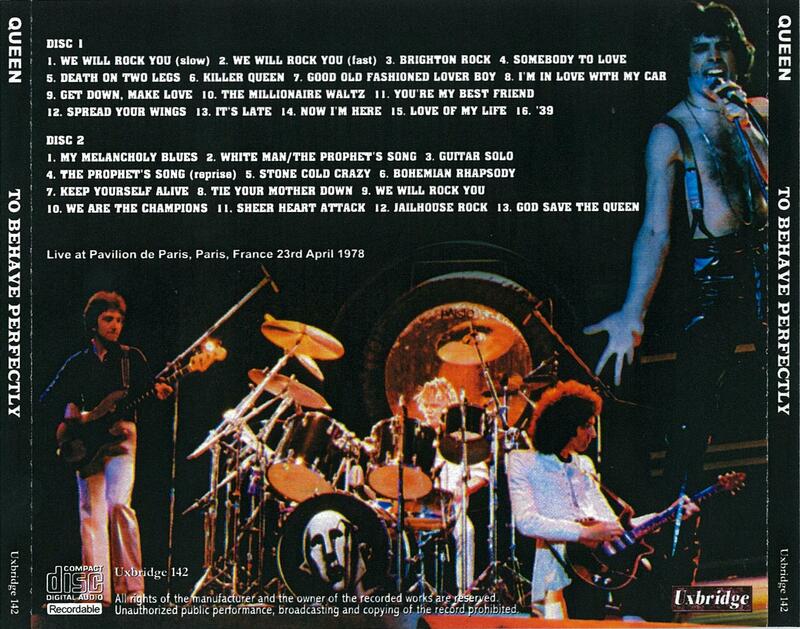 This is one of the better-sounding recordings from the tour. I haven't heard the Breakdown version yet, but if it follows in the footsteps of their other releases of the past few years, it's the same source as the RoIO listed above, and in similar quality.